A relaxed, cozy foot event among friends. We walked with braces in a couple of stakes to take a few pictures. 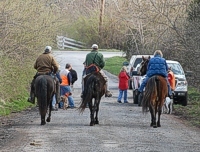 The Puppy Stake judges and bird planter head up the road to the breakaway area, where some handlers have parked with their pups, waiting to go. It's a beautiful spring morning, and this brace's two handlers are ready for the judges to say the word. 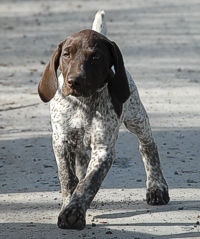 This is a Derby Stake - the Vizsla and Pointer in this brace are both youngsters. The judge is looking to see the dogs cast way out in front of the handlers and really work the field, hitting all the interesting cover along the way. Though a hunter might want his gundog to orbit close to him in close cover, a pup checking back in with his handler during a field trial doesn't always help in the competition. This handler's encouraging his Vizsla to move back out ahead. Tatoo has definitely found himself in the spirit of the trial. Stretching out and covering ground is his speciality. But he can corner too - even on dewey, just-sprouted alfalfa. Coming up behind the judges is the bird planter and an observer. The bird planter throws down quail behind each brace so they'll be there for the next. And, coming up behind them, on a long looping pass, is Tattoo, who really doesn't give much thought to the horse he's goosing on the way by. Slow down, there, cowboy! Dogs are still expected to encounter and work birds even as they run big to show their drive. Ask the judge if you can water your dog, and you'll almost always get a knowing approval. While there is a course to walk, with a beginning and an end, the dogs go where the dogs go. It's not unusual for the judges to break up, and each observe one dog if they range away from each other. And as often as they work apart, both dogs can wind up a few yards apart from one another, each making separate game. In this trial, no birds are shot, so there are lots of quail up and around. Even after a high-speed jaunt from the breakaway, and quartering two large fields, the Vizsla half of this brace is still completely intent on encountering that next bird. The judges have called time, and the handlers call their dogs back in for some praise after a tense 30 minutes. A busy trial event is a great opportunity for this Shorthair pup to take in the sights, sounds, and social nuances that help build the confidence he'll need when his time comes. New experiences are great, but so is the nice comforting view from in dad's arms. Did we mention that no birds were shot at the trial? And, did we mention that the McKee-Beshers facility is essentially a swamp? 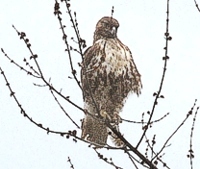 This Marsh Hawk set up shop right in Quail Alley. He looks pleased with himself. A Shorthair and his dad head out. Getting ready to ride behind a brace in the Open Gun Dog stake. Quail: eyes on the treeline. Dog: eyes on the bird. Handler: eyes on the dog. Stella was steady while the flushed bird disappeared. It's a 'walking' field trial in the sense that the handlers are walking. Judges and bird planters ride because otherwise they'd put on some serious miles. 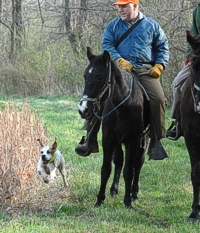 Plus, being in the saddle provides a good vantage for watching the dogs work. 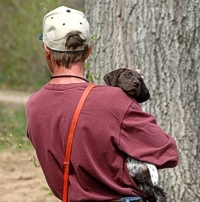 The Open Gun Dog judges pause their mounts in a stripe of sorghum to watch the brace work a treeline. She's 8+ years old, but Uma can still clear the thickets like a pro. Ol' Fly is all the stauncher on point for his years. Plenty steady to let his handler catch up to kick around for the bird he's found. The handler will, on flushing the quail, use the blank gun he's carrying to simulate a shot. The gun dog bird planter is dizzying up the quail in his hand before planting it in the field for the last brace of the day to find. And of course, after hours of chasing quail around in the field, where will one be actually waiting for you? It's OK, she doesn't weigh enough to scratch the paint.